It's been one year since we arrived in Santa Fe! I remember being so excited when we reached the state border. 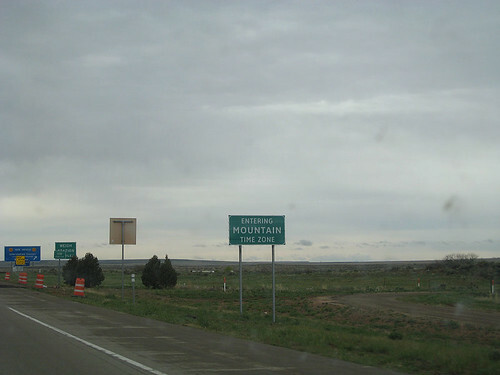 In fact, I almost wrecked because I was trying to take pictures of the "Welcome to New Mexico" sign and the sign above. Not too smooth. It's been a great year in the southwest and we're looking forward to the next one. I am a very tired girl this morning. The cats never let me sleep, but sometimes it is worse than usual, and this is one of those weeks. The lack of sleep is really catching up to me and starting to affect my spirits. Just. Want. To. Sleep. Yesterday also took a lot out of me between the news we got at the vet and the six trips to grocery stores that I mentioned over there in the sidebar. Rocky has an abnormally low glucose level which might not mean anything, but it could also mean that there is something going on inside of him. The vet mentioned tumors, cancer...not good stuff. But, considering that he is acting perfectly normal at home, we're hoping that all these tests are for naught and that he is fine. This morning we're taking him in for an ultrasound. They are going to check his heart and now his abdomen as well. He's already been to the vet twice this week so I feel badly about putting him through even more trauma. Hopefully it all goes well. I'll check in later with an update on Rocky and I'll try to post my Friday Flickr faves as well!